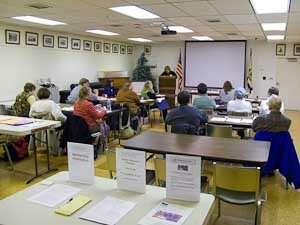 The “Meet and Greet” open house at the Martinsburg Library yesterday was a great success. More than 20 people came in to learn about the Arts Council’s programs and to offer their ideas about what is needed in the arts community. The Journal sent photographer Ron Agnir to get some shots and they are posted on the Journal web site. Those who came to the meeting also were able to pick up information about the Arts Council’s January 30 Artisan Workshop on the Business of Art as well as information about the West Virginia Commission on the Arts grants programs. Debbie Haught, the Community Arts Coordinator for the WV Division of Culture and History (WVDCH) braved a winter storm to drive from Morgantown to Martinsburg to keep her date with 18 artists and arts organizers and deliver an excellent three and a half hour workshop on the grant programs at the WV Commission on the Arts. In spite of the weather, the room was nearly full and there was a lot of energy being generated as one after another heard about the grant opportunities. The Berkeley Arts Council and the Martinsburg Berkeley County Library hosted the event. Debbie started by discussing some general tips for writing successful proposals, and then worked through most of the long list of grant programs offered by the WVDCH. The programs run from “mini-grants” that are designed to support small, one-time events up to cultural facilities grants of half a million dollars or more. Of particular interest were the Professional Development Grants that are available to individual artists and artisans who wish financial assistance that will help them move to the next level with their art. The program can support learning activities, such as workshops, or the purchase of a critical piece of new equipment that will give the artist the ability to increase the quality of their art. Debbie distributed information and grant application packages. She told us that the WVDCH web site was currently under revision and that within a few weeks all of this information and forms will be available for download, in time for the upcoming deadlines. The major deadlines are February 1 (for the Professional Development Grant), March 1 for the majority of grants for programs and organizational support, with a few special grants pushed to April 1. All in all, everyone who participated thought the presentation was excellent and everyone seemed to be ready to go home and start brainstorming for grantable ideas. Watch this web site for more information and links to grant program information and application forms on the WVDCH web site as soon as they have completed the updating. ArtBerkeley was formed in 2006 and has grown to be the largest organization of artists, for artists in Berkeley County, if not the region. In the past year, ArtBerkeley has organized exhibits for their members in The Arts Centre, the Dunn Building, and in numerous windows throughout downtown Martinsburg. In addition, ArtBerkeley organized the very successful Earth Day Festival in War Memorial Park last April, and is planning to make it even bigger and better next April. We hope that the Arts Council can partner with ArtBerkeley in the years to come in a way that will amplify their efforts to expand the opportunities for artists to display their work and enhance the presence of the arts in Martinsburg and Berkeley County. For more information about ArtBerkeley, check out their web site at www.artberkeley.org.